Today is, of course, Valentine's Day -- a day when romance and love are celebrated. To mark the holiday, we've got a special edition of the Saturday Sparkler column that is dedicated to love -- or, at least, to marriage! Today's grouping of tiaras is a very specific one: sparklers that have become part of a bridal tradition in various royal families. Enjoy! Dating back to the imperial court of Napoléon Bonaparte, the Cameo Tiara is a part of a larger parure of cameo jewelry. Early wearers included Queen Hortense of Holland and Joséphine of Leuchtenberg. Appropriately for a tiara that has become associated with romance and weddings, the pearl and gold piece depicts scenes from the myth of Cupid and Psyche. 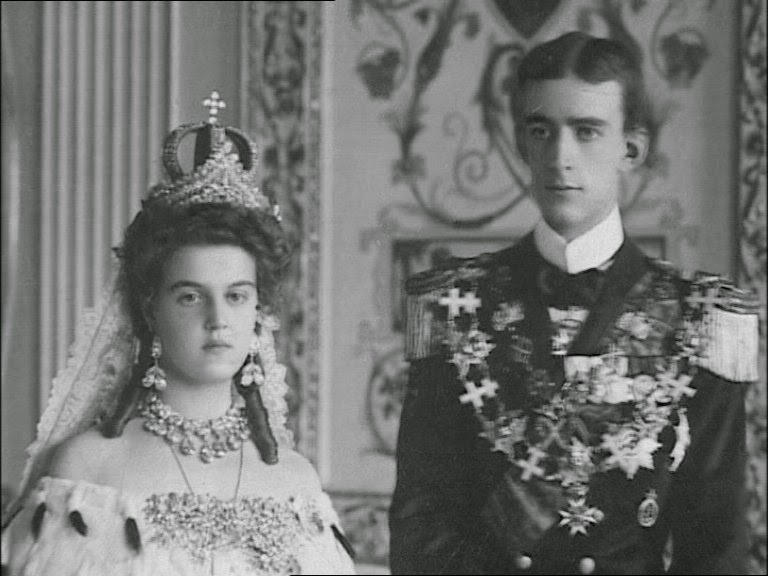 The piece became a traditional bridal tiara in the middle of the twentieth century, when it was worn by Princesses Birgitta and Désirée (sisters of the present king) and Queen Silvia. The tradition stretched to a second generation of royal brides when Crown Princess Victoria wore it to marry Daniel Westling in 2010. Rather than belonging to a single nation's royal family, the Prussian Tiara has passed through a line of royal women that stretches from imperial Germany to present-day Spain. The diamond and platinum tiara was worn by Princess Viktoria Luise of Prussia, daughter of the last kaiser, at her wedding in 1913. Her granddaughter, Princess Sophia of Greece and Denmark, wore the piece in Athens when she wed Juan Carlos of Spain in 1962. And the present Spanish queen, Letizia, borrowed the tiara from her new mother-in-law for her royal wedding in Madrid in 2004. Two generations of Luxembourgish royal brides have worn this convertible necklace/tiara, which was made using diamonds given to Grand Duchess Joséphine-Charlotte as a wedding gift by the colonial government of the Belgian Congo. The piece also has a matching bracelet. It was worn by Joséphine-Charlotte at her religious wedding ceremony (though not in her wedding portraits); her two daughters, Marie Astrid and Margaretha, and her daughter-in-law, Grand Duchess Maria Teresa, also wore the tiara at their weddings. After Joséphine-Charlotte's death, the tiara was nearly sold at auction; however, after the public protested, it was returned to the grand ducal vaults. Unlike many royal families, the Brits don’t really have one dedicated tiara in their arsenal meant for brides. The closest the family has to a wedding tiara is this piece: the fringe tiara that first belonged to Queen Mary. The present Queen wore the tiara to marry Prince Philip in 1947, although the tiara snapped shortly before the ceremony and had to be hastily repaired. Her only daughter, Princess Anne, also wore the tiara at her first wedding in 1973. Since then, however, British royal brides have opted for different wedding jewels. The Russian imperial family decked its brides in numerous traditional wedding jewels, including this tiara, which featured a large pink diamond in the center, a nuptial crown, a necklace, earrings, and an incredibly large brooch used to clasp the bride's ermine mantle. The jewels were scattered after the revolution. The government has retained the tiara, while the crown resides in the Hillwood Museum in Washington, D.C., the earrings and the buckle brooch are, I believe, in the nation's Diamond Fund, and the necklace appears to have vanished. Given to Princess Margaret of Connaught as a wedding present by the Khedive of Egypt, this Cartier tiara has become the official bridal diadem of her daughter's family. All of Queen Ingrid's daughters and granddaughters has worn the tiara so far at their weddings, and there are a number of additional female-line descendants who will also one day be eligible to wear the sparkler. The tiara now resides in the collection of Ingrid's youngest daughter, Anne-Marie, the former Queen of Greece.